Users will notice refinements including a more responsive Finder; Mail that loads messages up to twice as fast; Time Machine with an up to 80 percent faster initial backup; a Dock with Exposé integration; QuickTime X with a redesigned player that allows users to easily view, record, trim and share video; and a 64-bit version of Safari 4 that is up to 50 percent faster and resistant to crashes caused by plug-ins. Snow Leopard is half the size of the previous version and frees up to 7GB of drive space once installed. System applications including Finder, Mail, iCal®, iChat® and Safari are 64-bit and Snow Leopard’s support for 64-bit processors makes use of large amounts of RAM, increases performance and improves security while remaining compatible with 32-bit applications. Don’t know if your computer is compatible with the new OS? It’s quite simple to figure that out. Just click on “About This Mac” from the “Apple Menu.” If you are running Mac OS X v10.5 Leopard on an Intel based machine, you are good to go! 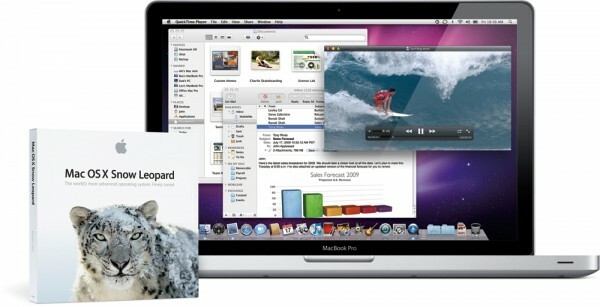 All you’ll have to do is purchase Snow Leopard and pop in the disk to upgrade! So what are you waiting for? Head on over to Apple’s Online Store which even guarantees FREE delivery to your door on August 28th, 2009!